The WSJ is now being edited by a man who cut his teeth in the fiercely competitive Australian and UK markets, where front-page stories drive newsstand sales and newsstand sales drive profits. Sweeping curbs on pay and roiled allies make for great headlines, and mean that readers are that much more likely to shell out $2 for the paper. Unfortunately, they also increase readers’ mistrust in the paper — Americans aren’t used to the feeling, common in the UK, that the headline massively oversells the story. The WSJ doesn’t need to do this, but Murdoch does: it’s in his blood. A Murdoch paper without punchy headlines which grab you by the throat is pretty much a contradiction in terms. Readers of the WSJ will have to get used to trusting the stories more than the headlines, or the implicit news judgment which governs where they’re placed. The WSJ’s journalism seems to be much less scathed than the headlines have been. This assessment sounds a bit….how to put this….rosy to me. Sure, maybe Murdoch will be content to jazz up the Journal’s headlines and leave the rest of the journalism alone. But what are the odds? It’s not as if he’s ever been happy with half measures like this before. Surely it’s far more likely that this is merely the first step toward remaking the paper along the lines of his other properties, isn’t it? 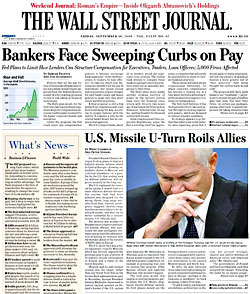 I figure it’s only a matter of time until the WSJ is just a printed word version of Fox News.